Will it appear in time for the PSVR launch this October? Since Sony announced the closure of Evolution Studios, a question has remained over Driveclub's promised virtual reality feature, which was demoed at Paris Games Week and GDC. It now looks like it's still going ahead. That's because a trademark for Driveclub VR has been filed with the Entertainment Software Rating Board, where it's been rated E for Everyone. These new signs of life give us hope that we'll see it in time for the launch of PlayStation VR, the PS4's virtual reality headset, this October. 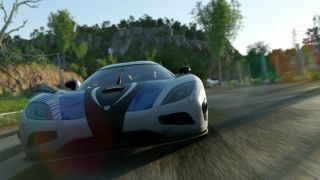 After announcing Evolution's closure, Sony announced that it would continue to support Driveclub, so it makes sense that it would want to get the VR support finished. As you might know, Driveclub had a bumpy start, but over time was improved significantly. It was also very impressive on a technological level. Of course the best news from this whole fiasco is that developer Codemasters stepped in to buy Evolution Studios. "This expansion will not only see us gain a wealth of racing expertise and skill, but it'll take Codemasters to the next level as the world's largest racing-focused games company," wrote Codemasters' Christina McGrath at the time. "With phenomenal racing DNA on both sides, we hope that gamers out there are excited to see what we do next – as are all of us here at Codies." Driveclub is not the only VR racing experience that Sony has planned. Polyphony Digital's Gran Turismo Sport was also announced at Paris Games Week last year and will be compatible with Playstation VR.